A big hello to all my friends in Blogland! It's Marie here and I am excited to share with you a card I created. 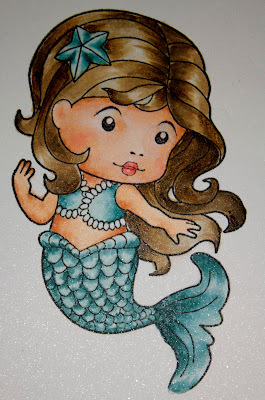 I selected an adorable stamp called Mermaid Marci by La-La Land Crafts. 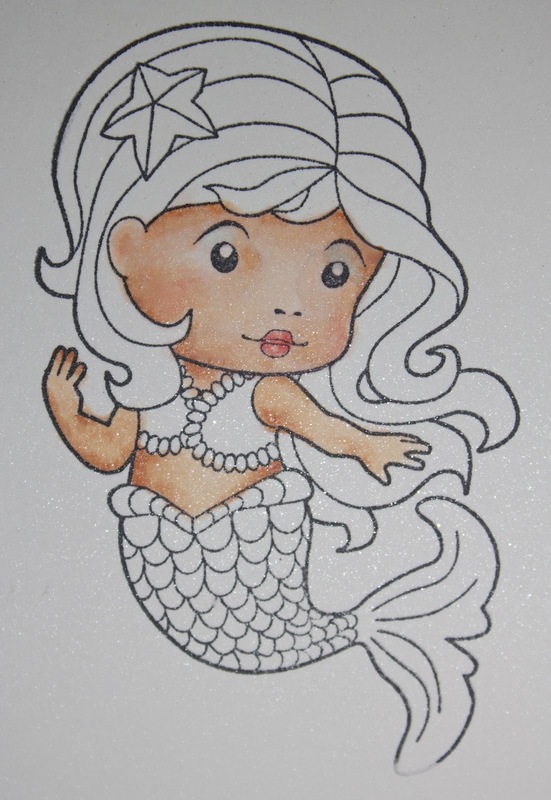 The size of this stamp makes it perfect for cards or projects and the size is large enough that it makes it fun and easy to color with those Copic Markers! 11 in x 4.25 in. Score at 5.5 in. to make a finished card of 5.5 in. x 4.25 in. Base layer: 5.25 in. x 4 in. Top layer: 5 in. x 3.75 in. E40 is applied to the highlighted areas. E44 is used for the darkest shadow area. The mid-tone is E42. Take care to not over-blend so some of the streaks of hair remain for a more realistic look. BG70 is used on the area on the area that reflects light. BG75 is used in the darkest shadow and blended out with BG72. Care is taken to avoid losing the highlights. The starfish can be treated like a "fold" in a dress in order to give it more dimension. 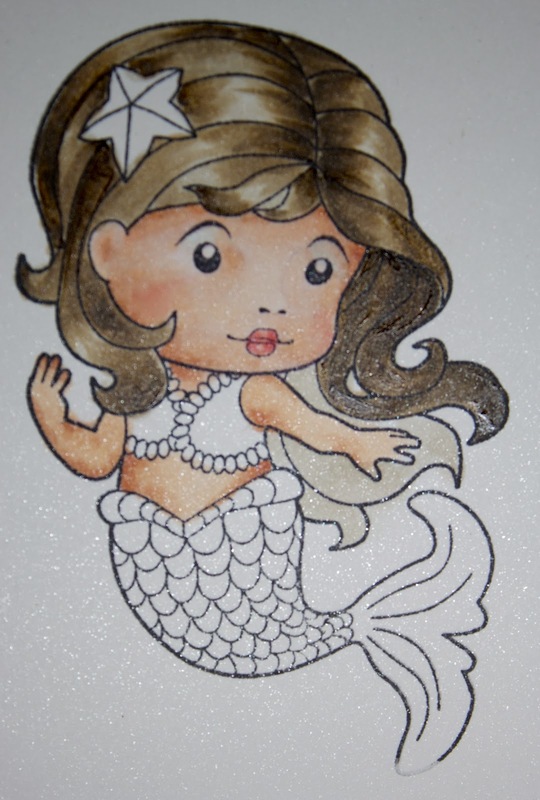 This is a close up of the cute little image. Oval dies are used to cut the image and mat. 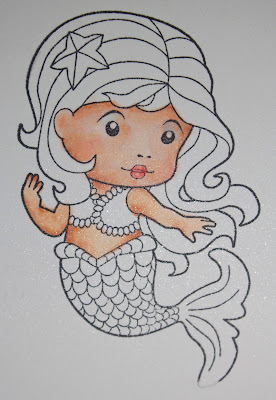 Embossed the image while it is still in the die to give a great finish.. Tumbled Glass and Broken China Distress ink are sponged around the die. Start off the paper and lightly sponge toward your image. I lightly sketched some circles and colored them to look like bubbles. TIP: Steps for creating "bubbles". A very small amount of the Opaque White was applied with a toothpick. I used a technique that Marianne Walker teaches for dew drops on leaves - except I did not use the darkest color for the bubble but chose to use my lightest color, shaded with the next darker color and then applied the white light reflection. 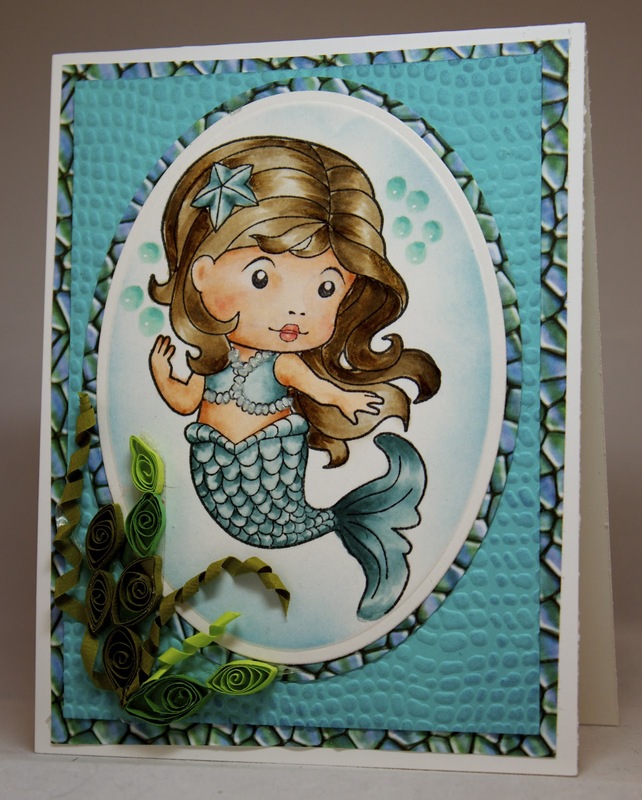 The card was assembled and quilled seaweed and foliage was applied. I quilled a seahorse to go with it but it was way too much! Sometime less is more! I hope you enjoyed this card. It was fun and I was delighted with the way the bubbles turn out. Thank you for stopping by and don't forget to come back tomorrow and see what special treat Kelli has in store! Wonderful coloring and instructions. Thanks so much. This is so adorable and cute I really love it . 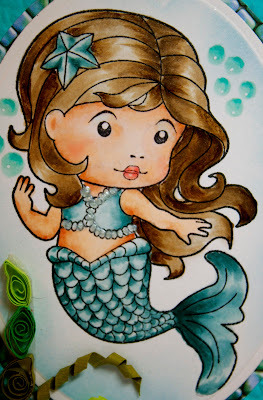 This is a beautiful card and your coloring is amazing. Love the cute bubbles too. This is very pretty1 Love the designer paper, and the bubbles are really neat. TFS! Love the detailed instructions so much. Thanks for sharing those and your beautifully colored card. Simply beautiful. 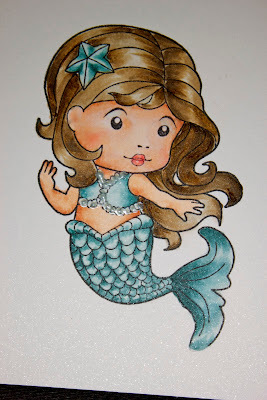 I love mermaids and this is a cutie! Cool idea with the bubbles, too. So Beautiful!! Love those gorgeous BG's and that fun paper too! Beautiful card, thanks for the tut.